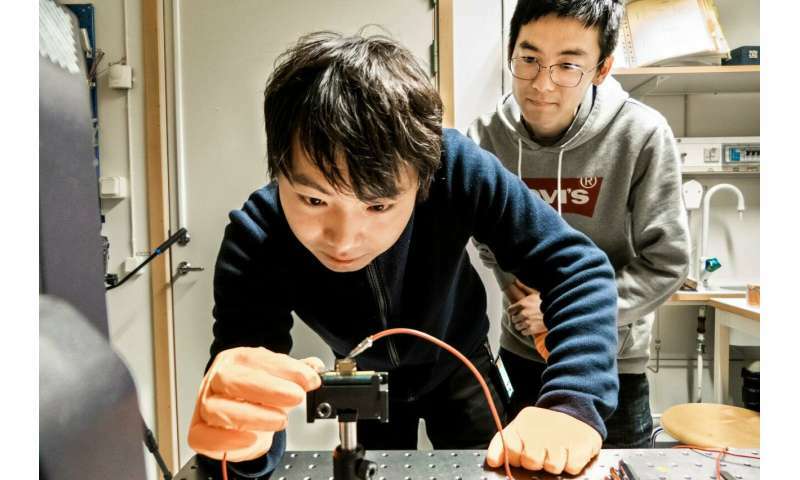 Efficient near-infrared (NIR) light-emitting diodes of perovskite have been produced in a laboratory at Linköping University. The external quantum efficiency is 21.6 percent, which is a record. The results have been published in Nature Photonics. One way of dealing with defects is to add materials known as "passivation molecules," which bind to the atoms that cause defects. The researchers had previously discovered a molecule with amino groups at its ends that gave a certain improvement in properties. However, when they selected a molecule that also contained oxygen atoms, the effect increased dramatically. "We now understand that it is the hydrogen bonds between passivation molecules and perovskite materials that cause problems. This allowed us to search for a molecule that was perfect for passivation," says Feng Gao, senior lecturer in the Division of Biomolecular and Organic Electronics at Linköping University. "This particular perovskite material gives highly efficient light-emitting diodes in the near-infrared region. Near-infrared light-emitting diodes are particularly useful for medical and telecommunication applications. We believe that our new findings can also be applied to perovskite light-emitting diodes with other colours," says Feng Gao. 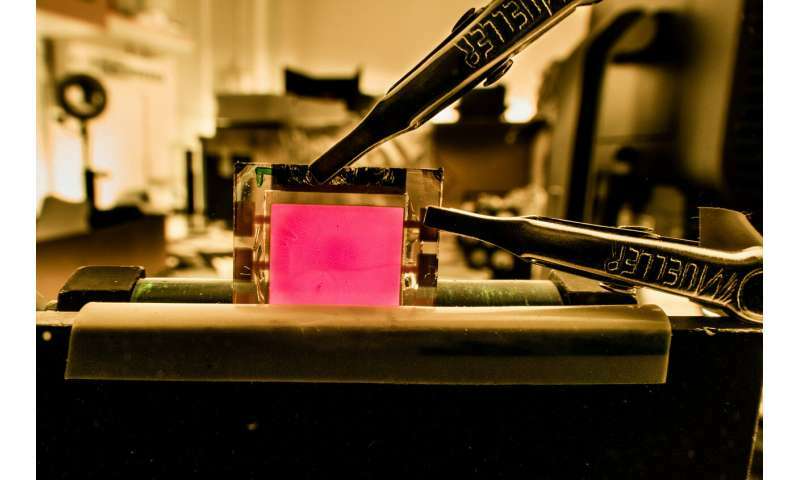 "We have developed the best light-emitting diodes in perovskite material yet. They can also compete with light-emitting diodes based on, for example, organic materials," says Wiedong Xu, postdoc in the Division of Biomolecular and Organic Electronics, LiU. Quantum efficiency for LEDs is the number of photons emitted divided by the number of charge carriers injected. Since photons (aka light) do not have a charge, "charge carriers emitted as light" would be a discovery worthy of a Nobel prize since such a particle would be far beyond the standard model. Wall plug efficiency (energy emitted as light divided by electrical energy input) would be of interest. Commercial visible light LEDs can exceed 80% (quantum efficiency is even higher). light -emitting diodes might be great energy-savers, but their presence as used in outdoor lighting is set to ruin billions of dollars worth of astronomy infrastructure because unlike discrete-wavelength metal (sodium, mercury) lighting, their wavelengths cannot be screened-out and pristine skies will be slowly light-polluted.